So tell us Tricksta how long did this project take to make? I started it in the summer of 2007 and it was complete in July 2008. I wanted to make a project with sturban clothing that really stood the test of time, and I guess by making all the tracks exclusive I have done that. I also wanted to do a DVD. I've wanted to do a DVD for ages, so I thought why not do it on this project. So for those that don’t know tell us who features on the mixtape. Well I always try and rep different endz. From Wolverhampton I got LATE, 10Shott, Jai Boo, Size8, A1, Conman and myself. I got some sick skits cut up by Jabba Tha Kut who also got me an exclusive from Magishan, and they are both from Bournemouth. I got Bristol being repped by Kelz and Trz aka The Souljah Clique, Bungle from Sheffield, Double E from Gloucestershire, Kid Rad from Lichfield, Unfriendly Neighbours from Tamworth, Deadline from Birmingham, Hard Livin from Essex, and London artists Swift It Major, Reain, Big Cakes, Logic, Manny Moscow, Cons from The Colony, Jimmy Raygun, Debonair, P.A.C and Yaeo. It features some of the people on the mixtape as well as Blak Twang, Million Dan, Supar Novar, an interview with HHBRadio.Com and a street artist from the Midlands called Matt "The Artist". There are a few unseen music videos too. It’s around an hour long because I didn’t want it to be boring. UK Runnings has been moulding a string bond with sturban clothing. Tell us more about that. Glyn is like family to me. 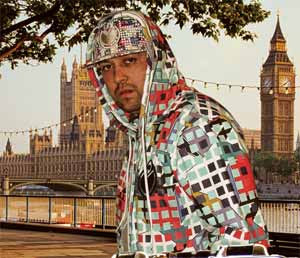 He has always understood UK Runnings and what it is all about (promoting and pushing quality home-grown hip-hop music). We hooked up when he sponsored a volume of UK Runnings around 2005. The rest is history... Since then we’ve done a total of three mixtape releases ("sturban clothing Mix", "Music For The MySpace Generation" and now "100% Exclusive"), I also do a monthly radio show which is broadcast on sturban clothing website (to listen go to the website at www.sturbanclothing.com, scroll down and at the bottom left hand corner simply click Urban Shop Radio. sturban clothing sponsor me throughout too, so you can guarantee if you ever see me in some sick garms and want to know where they are from they are from www.sturbanclothing.com. So do you have a fourth mix planned? Yes we do, it won’t be out until 2009, but the next release from us will be called "Urban Runnings". 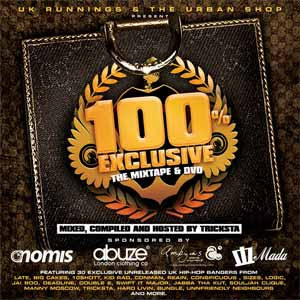 It will be a double CD that features different genres such as UK Hip-Hop, Grime, Dubstep and Drum’n’Bass. It’s going to feature some guest DJ’s. And UK Runnings? Anything else planned there? Well yeh, I am just compiling "Flying The Flag" which as a collaboration project with Lunatrix from HHBRadio.Com. That’s going to be a double CD with 50 tracks! Massive release with loads of exclusives. So as a producer and mixtape DJ what else have you been up to Tricksta? You know me, always got loads of projects on the go! I have just produced LATE’s debut album "Below Street Level" which a tight fourteen track CD that features the likes of Willie D from the Geto Boys, K-Rino and JT The Bigga Figga. Now I am starting to work on tracks for my debut album "Urban Mathematics" which is planned for a release late 2009/early 2010. There are other things I am producing too but I am sworn to secrecy! Mixtape wise, just done mixes with KB Da Kidnappa, Keak Da Sneak, The Jacka, 2025NYC.Com, LATE and many more. What would you say have been your biggest achievements in Hip-Hop so far? Releasing over fifty Hip-Hop CD’s on my own record label, all of them official, and all pressed up. No big thing for any USA record label, but for a bloke from the Black Country I think that’s a big statement! Working with some of the biggest names in the scene (both UK and USA), being asked to present the award to best Hip-Hop act at the UMA’s in 2007, Willie D from The Geto Boys rapping on one of my beats, producing a track on K-Rino’s last album that came out in the USA and putting my city on the Hip-Hop map. Big up everyone from Wolverhampton! So where can you get "100% Exclusive"? As with all Wolftown Recordings releases you can get them from HMV, Zaavi, iTunes, Play.Com etc, and if some reason they haven’t got it in stock everything is always on www.wolftownrecordings.com. Okay before you go, anything else you want to say? Yeh, I run a promotions company. Any UK or US artist looking to get exposure should get in touch www.myspace.com/parkstreetpromotions. Come and see why we got 5000 in three months of launching the MySpace page. There are more details on the website at www.parkstreetpr.co.uk. Thanks for the chance to do this interview and much love to everyone involved in this project from Glyn at sturban clothing – check www.sturbanclothing.com and get yourself some new garmz, Luna & Vokal from OYM Media who dealt with the DVD and some music videos, all the artists that contributed to it and a massive shout out to the sponsors… Abuze London, Mada, Ambiguous Clothing and Nomis.